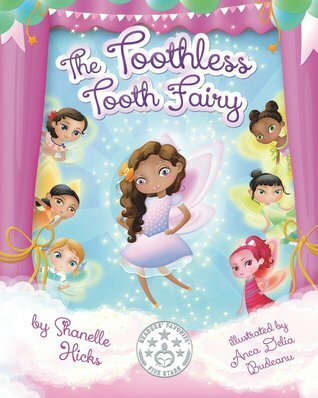 The Toothless Tooth Fairy tells the story of Bella, a tooth fairy who becomes the victim of another fairy’s jealousy and must try and replace her missing tooth for fear of losing the imminent smile contest. The lengths that Bella goes to in order to recover her perfect smile are amusing, the humour only added to by Anca Delia Budeanu’s illustrations. Budeanu’s illustrations are wonderful, they are creative and clever, and bring great colour to the page making you feel like you too are on Cloud Nine. The colours are soft but still manage to stand out on the page, and the uniqueness in each tooth fairy is great as well. The accompanying text is clear and easy to read on the page, displayed as if in its own cloud which only adds to the feeling of being on Cloud Nine amongst the tooth fairies. Displaying the text in this way leaves the illustration to fill the rest of the page, but in doing so it doesn’t take away from the words. The language used is clear and simple, but still filled with a lot of meaning, a little bit of magic, and a friendly tone. Hicks’ story is interesting because there isn’t just one message to take away from it, and while there is a crime of sorts, no one is made to feel like a victim, nor an enemy. Hicks is clear from the start about what makes Bella beautiful is not just her perfect teeth or her nice hair, but also her kindness. And while Bella becomes self conscious and doubts her own beauty when she loses her tooth, Hicks never makes physical beauty the most important aspect, even the tooth fairy contest isn’t a beauty pageant, it is for who has the nicest smile. This shows that even with Zelda’s jealousy, there isn’t an attack on who is more beautiful than anyone else, nowhere does Hicks say physical beauty is more important than being a good person. This is a wonderful message to give to children who read this, and one that a few adults wouldn’t hurt to remember every now and again. The Toothless Tooth Fairy is a great book that leaves you with a smile on your face as you finish. There is a wonderful message in Bella’s story that explores feelings of jealousy as well as insecurity, but also promotes the ideas of inner beauty, kindness, and being a friend.